GMB, the only union to vote against the government's NHS pay deal, pledge to continue fighting it. Junior doctors protest contract changes in 2015. Image: Rohin Francis (CC BY 2.0) Since our members overwhelmingly rejected Jeremy Hunt’s dodgy three year NHS pay deal earlier this year, we have been consulting them on the next steps. During the past few weeks, members have used the ballot process to tell reps on the ground about their huge disappointment at this pay deal and how let down they feel by it. After nearly a decade of wage freezes and caps that have seen our dedicated NHS and ambulance workers’ pay pinched and left them thousands of pounds out of pocket, a below inflation wage increase for some of the longest-serving, most dedicated staff in the health service is not good enough. Our members deserve far more than a real terms pay cut. 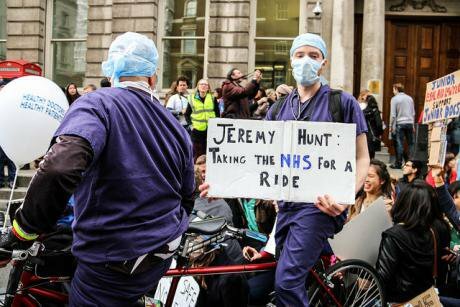 We have said all along that we could not in good conscience recommend Jeremy Hunt’s offer to our members. And so we didn’t. GMB was the only union of 14 health service representative bodies to have rejected Jeremy Hunt’s offer for what it was, and our ability to take industrial action this year alone has been limited accordingly. That, coupled with the government’s anti-trade union legislation which makes it extremely difficult to meet legal thresholds for a formal industrial action ballot, are why we are unable to trigger a formal industrial action vote over NHS pay this year. The message from GMB members has been loud and clear throughout our consultation – we must continue to campaign for more funding for NHS pay. This three year deal is not an acceptable settlement for us. A joint meeting between GMB National NHS and Ambulance Service reps and officers has overwhelmingly agreed that although we are not in a position to ballot for industrial action, GMB's campaign does not stop here. As we have promised to members, GMB will continue to push the government into increasing funding into the NHS for pay. Anyone who thinks we will lie down and simply accept this pay deal for the next three years is very wrong. It’s not good enough – and this is not the end of the matter. The strength of feeling among GMB members is very clear on that. We’re incredibly proud of our members for taking a stand – and grateful to the support and solidarity we have received from workers across the NHS and from the public at large who support our call for properly funded fair pay for the heroes working in our health service. Under this government our NHS is under threat. For it to survive, we need to continue to fight for it and the people who keep it going every day. And GMB will.